HTL continues with part eight of the Tiger Hunt series, called "On Deadly Ground." We're now going to take a break from the Forge's battle against the Nephilim dreadnaught and take a look at the Border Worlds forces distracting the Nephilim. As you saw in part seven, the Border Worlders had deliberately revealed the position of their carriers to draw the Nephilim fighters towards them, and away from the capital ships targeted by the rest of the Combined Fleet. The major drawback to that plan though, is that the flight wings from three different super carriers are now poised to descend on the Border Worlders. This chapter picks up from there, and is written by yours truly, so please send any and all comments to me. A couple of notes about Border Worlds tactics and fighting styles: I'm working on the theory that the Border Worlders, having older and fewer ships and fighters than Confed does, would have trouble fighting a conventional fleet action. Instead, I would expect that they use their better knowledge of the "terrain" and their unconventional tactics to good effect. I would also expect them to be pretty ruthless when they had to be, as they showed in WC4 by destroying the transports filled with infected Telamon refugees. Take a breath people, this is a very momentous and historic occasion for the FreeSpace community and for all FreeSpace fans. FreeSpace 2 Source Code has been released. All of the countless changes, fixes, and modifications that we've all wanted to make to FreeSpace 2 are now possible. I am the last person to ask about the possibilities that this opens up for projects like The Babylon Project, but its definitely a major event. 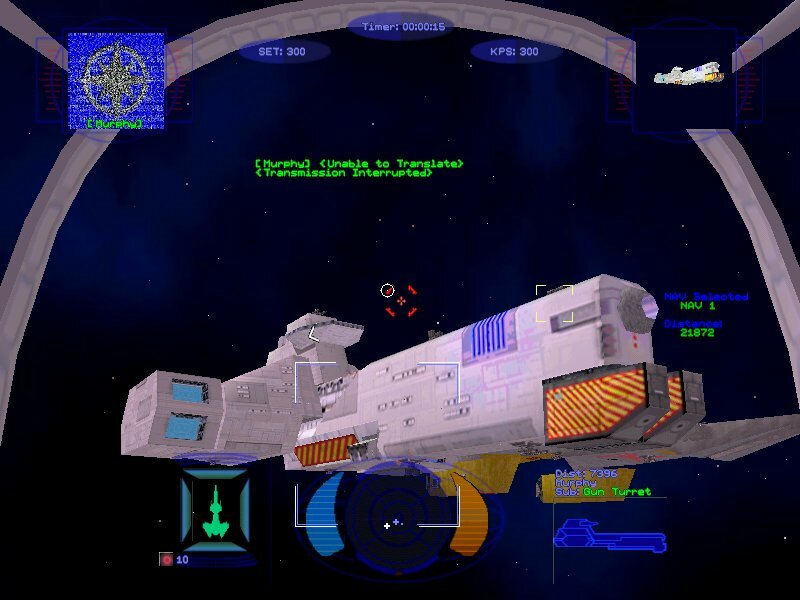 A very excited Cpl Hades remarked : "Boy, I hope somebody creates a Wing Commander mod with really big capships!" It's true. LOAF turns 21 today which I'm told comes with the ability to buy vast amounts of alcohol and firearms - legally! If you are a freak or even if you aren't you can wish LOAF a happy birthday or ask him to buy you alcohol by emailing him here. Everyone else is! Emperor Quark has created a nifty Wing Commander Strategy game using Macromedia Flash. You can try your hand at it here (700k) -- a great way to waste those long hours at work. Requires Flash 6, available here. Happy has done a super-neat animated CIC logo! Check it out here. Flying one's and zeros -- take that, old Origin site! Remember Scrap? He made those Wing Commander guitar tabs some months back... and now he's put his fingers where his mouth is and recorded himself playing an acoustic cover the theme. It's pretty good -- and you can add it to your mp3 playlist by grabbing a copy here. Heh, fingers where his mouth is... to think I don't get paid for this. Kn'thrak has found a set of five Wing Commander Windows themes at Top Themes. They're #61 at this site... so go... replace your Windows logo with a cat or something. HTL continues with the third part of "Further Down The Spiral 2", as the Forge crew intensify their battle against the enemy dreadnaught battlegroup. You saw last week that the Forge pilots had launched a preliminary strike to weaken the dreadnaught's escorts, but had encountered heavy resistance. This week, that battle moves into high gear. This chapter is jointly written by all the Valley Forge writers, so please send any and all comments to them. Wing Commander TV Show Cast! 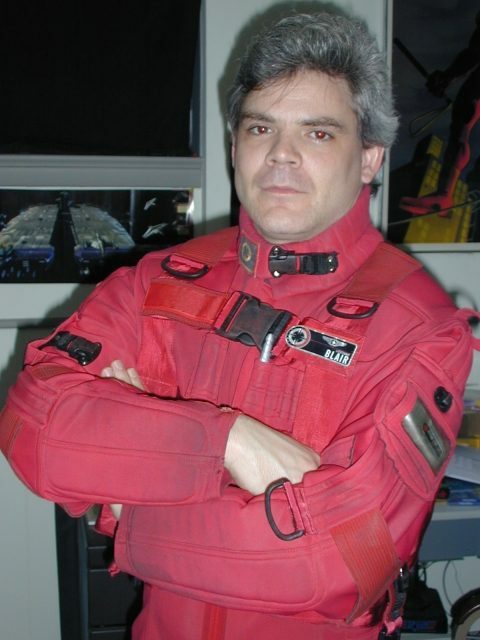 Chris Roberts' PNR Films issued a press release today announcing that the role of Colonel Blair in the upcoming Wing Commander TV show has been decided: the legendary fighter pilot will be played by The Origin Museum's Joe Garrity. Said Roberts: "We wanted to go with an unknown instead of a teen idol this time... but I think the results will speak for themselves: Joe Garrity will be the next Freddie Prinze Junior." Pictured below: Garrity in full costume. WingNuts everywhere can finally breathe a sigh of release -- a long-debated treaty with SpaceBattles has finally been signed. Master negotiator Bob McDob summed it up best: "In exchange for allowing Freespace and Star Wars ships to have six times as many guns Wing Commander ships will be considered invulnerable to being attacked by dogs! Additionally, all references to 'durasteel' in the WC canon will be considered to have read 'apple pie'. Let the intelligent debate begin!" 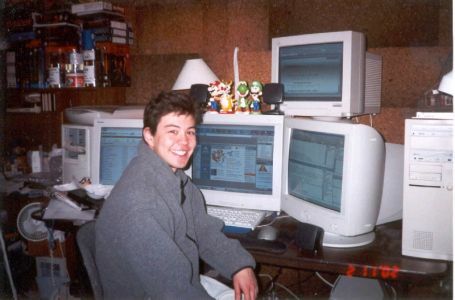 Chris Reid is WATCHING YOU! In a completely unexpected turn of events, the long-abandoned 3DO Console has claimed victory in the fierce console war. In a move that shocked the now-surrendered competition, the 3DO flew a desperate end run mission, striking the enemy fault line with highly experimental "M2" technology and toppling the three console giants. Although Sony, Microsoft and Nintendo (now "The Assembly of Consoles") could have easily struck back against the vastly inferior 3DO system they recognized that to do so would be without honor and surrendered unconditionally. Like most Americans, we don't really care about Akkbar anymore... but it wouldn't be April Fools Day without an Akkbar themed update. And this is it.